Do public sector wages have an influence in the determination of private sector wages? 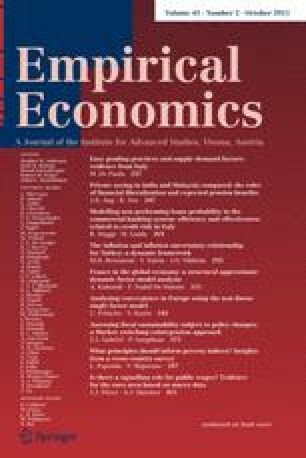 This article tries to isolate the pure signalling effect that one sector might exert on the other by controlling for other determinants of wages (prices, productivity, institutions) for the main euro area economies (Germany, France, Italy and Spain) and the periods 1980–2007 and 1991–2007. It exploits available quarterly information not yet used in the literature, and combines different data sources in the framework of mixed-frequencies time series models. The quarterly frequency of our data allows us to decompose the casual effects into purely intra-annual effects and across-years effects. Our conclusions establish the existence of purely intra-annual links between public and private sector wages (signalling effect). There is strong evidence of public wages’ leadership, either in conjunction with bi-directional links from the private sector (Spain, Italy) or pure public sector leadership (Germany and France in the sample 1991–2007). Our empirical approach allows us to also unveil a complex and rich structure of indirect links of wages with other variables (prices, productivity and institutional factors).